Getting braces at a young age can mean faster and more effective treatment. We advise that your child visits us for the first time around the age of 7. That’s because there is a window of opportunity to utilise a child’s growth and development. A consultation at this early age allows us to determine how and when your child’s particular skeletal and dental problems should be corrected. Early intervention can intercept and prevent an incorrect bite from developing. Some skeletal and dental problems are best treated at an early age when growth is plentiful. Early treatment enables the jaws to be precisely align as they develop and jaw size to be coordinated with tooth size. Each child’s growth potential is maximised so that all of the permanent teeth have room to come in naturally. Intercepting early problems makes the entire treatment process more comfortable and less traumatic for the child. It can also raise the child’s self-esteem. However, not every child requires immediate treatment. Sometimes we may simply want to monitor your child periodically while the permanent teeth erupt and the jaws and face continue to develop. Ask your child to bite all the way down, but keeping their lips open so you can see their teeth. Do the front top teeth line up with the bottom? Do the top teeth protrude out away from the bottom teeth? Do the top front teeth cover more than 50% of the bottom teeth? Are the top teeth behind the bottom teeth? Are the teeth (front &/back) coming into contact when the child bites down? 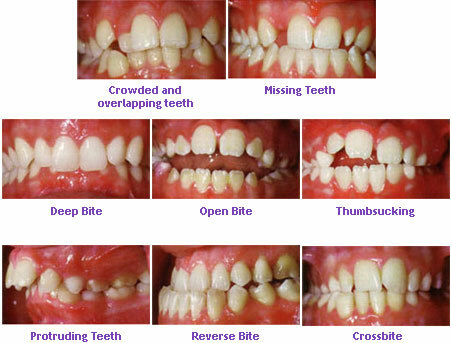 All these are indicators for potential orthodontic treatment. The alignment of your child’s jaw. Look at the alignment of your child’s jaw. Does the jaw shift off centre when your child bites down? If you see any misalignment or shifting of the jaw, your child may have a skeletal problem, which requires early orthodontic intervention. Does your child have any persistent oral habits such as thumb sucking or finger sucking habits after 2 years of age?